Whether you’re heading to the mountains, for a weekend out on the trail, or simply for a jaunt in the hills, one thing you can’t afford to be without is good quality waterproof gear. At some point you’ll get caught in a downpour or hit by a shower where the rain seems to be blowing sideways, and you’ll fair a lot better if you’re wrapped up in a well made outer garment. Where you might be able to sacrifice quality for price with other accessories or items of clothing, a good jacket will make all the difference between an enjoyable experience and a miserable, wet one. Choosing the right jacket is not an easy task. Head into your local outdoor or hiking store, or start browsing online, and you’ll notice there is a huge difference in materials, sizes, weights and prices. So below are some key things you’ll want to take into account when looking at jackets. In general, a higher priced jacket means it has greater capabilities but not everyone will need them all. If you go walking in the British countryside for leisure at the weekends, a basic rain shell jacket would likely suffice. If you’re a serious mountaineer where you could get caught in a white out at minus ten degrees, then you’ll need something a bit more impressive. When and where will you be using your jacket and for what activity. On the whole, it’s probably going to be for hiking and general outdoor use. This means that something relatively basic, but still of a good quality, will suit your needs. What type of weather will you be mostly using your hiking jacket in? Are you going to be using it all year round or just in colder temperatures? You might want to consider the period of use each time you wear it – whether it will be for a day or two, or a few weeks. Chances are it will be in a temperate climate, but if you’re going somewhere with humidity then you’ll certainly need something breathable with under-arm mesh or zips. Always make sure you buy a jacket that has room underneath for additional layers, without buying one that is so loose that it gets in the way. For most hikers and weekend ramblers, a rain shell jacket made using 2 or 2.5 Layer construction with sufficient layering will happily meet their needs for rain and warmth protection. Even though you might think there’s not much of an issue with carrying a few hundred grams extra here and there, weight is a factor you should consider. Whether it’s on you or rolled up in a ball in your backpack, you could be carrying the jacket for ten hours at a time, amongst other things, and you’ll start to notice the difference. On the whole, rain shells will be lighter than hard shells. It’s unlikely you’d find any quality jackets that are not waterproof to some extent (unless you’re buying a fashion jacket from a high street brand – in which case, you’ve made your first mistake). Instead, you should be looking at what type of waterproofing they have. One of the most common types you’ll see will be Gore-Tex, the clever technology that keeps water out but let’s air pass through to allow ventilation and help wick sweat away from the body during exercise. A Durable Water Resistant (DWR) coating is what is used to keep the outside of your jacket from getting saturated – so look out for this on the label. As you can probably tell by this point, there is an almost infinite number of options and technologies in materials available for waterproof jackets. In a dream world, you want something that combines waterproofing with some level of breathability and ventilation. The best jackets will be both waterproof and breathable so water can’t get in but moisture/sweat can escape. A DWR-only rain shell may not have any breathability, so it would be important to look for vents and pit zips to counteract this. Although there are some cool puffer jackets on the market, they’re infinitely less practical than their shell counterpart. They are bulky, hard to condense down into your bag and can be a nightmare once wet. Our advice here? Avoid. On a similar note, there are specialised jackets for extremely windy environments – like sailing or cycling. Some of them are pretty high-tech and lightweight but they will generally have minimal waterproof capability and are therefore not very well suited to hikers. You can go all out and get a tougher hard shell jacket but in truth, that isn’t necessary for most. The ‘good news’ I refer to is that, in terms of waterproof protection, rain shells are probably the most accessible in terms of price and you can get a reasonable one from anywhere between £40 at the lower end to £200 or more at the higher end. Hard shell jackets are the fully blown waterproof jackets made with 2, 2.5 or 3 layers of material. The extra layers are fully breathable and totally waterproof. The base internal layer enables friction-free movement between your clothes and the jacket and protects the middle layer, which is waterproof and breathable. The outermost layer is usually nylon or polyester and water repellant. These rain jackets are cleverly design and the toughest waterproof option but carry a hefty price tag – meaning they’re an overkill for the average hiker. Further down the scale is a soft shell jacket, designed to be a light rain jacket and suited to generally good weather with the risk of light rain. Soft shells are lightweight and have some water repellent capabilities but would not hold up in a storm. The ideal option is a rain shell jacket, which lies somewhere in between. This category of jacket is perfect for hiking enthusiasts that will be out on the trail for between a few hours and a few days. They offer a good a level of water repellency (almost as good as a hard shell) but lack the same level of breathability. However, unless heading off to more humid climates, this wouldn’t be an issue. You can also get multi-purpose waterproof jackets that have layers built into them. For example, a hard outer shell with a fleece or jersey layer zipped into inside of the jacket. Although it might seem like a good idea, they’re less flexible than choosing your own layers. Depending on what you’re using your waterproof jacket for, there be additional features that might further enhance your outdoor experience. Some things that we would definitely want to look out for would be a hood that rolls up and zips or velcrows into the collar, pockets, pit zips (if your jacket isn’t very breathable, storm flaps that cover your zip during heavy downpours, and adjustable cuffs and hem draw-cord to keep the jacket tight around your body. So now you know what you’re looking for, let’s take a look at some of our favourite men’s waterproof jackets on the market right now. The good news is that waterproof jackets don’t need to break the bank, and we have a selection of mid-range, quality jackets that will suit most needs. For anyone needing a specialist cold or extreme weather jacket (for example if you’re heading off to climb Everest or sail the Pacific), you would want to buy something specifically suited to your adventure. 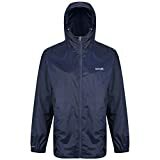 The Patagonia Men’s Torrentshell Jacket is a middle of the range jacket, in terms of weight, price and features offered. Renowned for providing great outdoor gear, Patagonia has designed this shell to be durable, lightweight and versatile. The 2.5-layer nylon jacket has a durable water repellent (DWR) finish but also promises a breathable barrier and some degree of wind protection. The hood rolls down, stowing away in the collar – like many of its competitors – with a simple cord and hook design, but has the perk of a laminated visor and stiffened hood, to make sure visibility remains even when pulled up and drawn in. Patagonia’s H2No performance-standard protection keeps the user bone dry and the jacket now has a 100% recycled 50D nylon ripstop fabric and interior storm flaps that create a zipper-garage chin guard. It is water resistant with a high rating of 20,000 mm, the ventilating pit zips have storm flaps and even the main zips and pockets are treated with DWR. The addition of a microfleece-lined neck means that your chin won’t be rubbed red raw when it’s cold and wet. Thanks to its midweight thickness, it can move between seasons with relative easy – perfect for summer with not too much underneath or allowing for a fleece or thermal during winter. The tough construction is pretty durable and it can be packed down into its own pocket with a handy clip in loop to attach to a pack. Note – this jacket also comes in a half zip option and there is also a parka version. Lightweight and comfortable the Quest is soft and flexible but highly water repellant. North Face uses DryVent, a breathable technology for waterproof protection but let’s moisture from the body permeate to the outside. The fabric is softer and lighter than Gore-Tex, and this jacket has a brushed knit back neck and chin guard lining to stop rubbing or chafe in cold and wet weathers, while adjustable elements ensure a snug fit. Although the hood provides reasonable protection, once the adjuster on the back is used to pull in the hood close round the face, the peak is flattened – making it somewhat useless. The roomy hand pockets are great and the elasticated cuffs stop water running into the sleeves. North Face’s DryVent fabrics are engineered to be fully waterproof, windproof and breathable. The polyester outer is treated with a durable water repellent finish and the multi-layer design is engineered to allow water vapour to pass from the inside to the outside. In terms of wind-proofing, the fibres are tightly woven to block air flow and keep the wearer protected against wind-chill, but for anyone looking for a highly wind-resistant jacket, it would be worth looking at other options specifically designed for those conditions. This jacket would be a good option for spring, summer and autumn but would need to be layered up in winter to provide the right degree of warmth. The Montane Minimus is a good looking simple but functional shell and very lightweight. Its ventilation and waterproof capabilities are great but the two things that set it apart are its suitability for warmer climates and its reflectiveness. The PERTEX Shield membrane provides exceptionally high fabric breathability at 25,000 MVTR, which means that even in hot and humid environments, the user doesn’t feel like they are sealed in with no way of body moisture to escape – which would certainly be the case with some of the other shells we have mentioned. The shell could also be worn in cooler damp and humid conditions over a fleece and base layer. The trade off for having a jacket that is so lightweight is that it lacks the same level of durability as its competitors. The PERTEX Shield membrane is somewhat fragile in that some users have reported some peeling in places where there is a lot of rubbing i.e. in the armpits and around the waste belt. Although this can be reduced, and to an extent avoided, this jacket would not be suited for someone looking to use it regularly through multiple seasons of high wear and tear. The zippered chest pocket (located to the left side of the full-length zip) is mesh ventilated, adding an additional level of breathability, but those who are accustomed to two large hand pockets may struggle as it is suited really only to carrying a map or light and flat essentials – another trade off for having a lightweight jacket. Lightweight shells are pretty easy to come by, but finding one that moves as well as the Minimus is not. 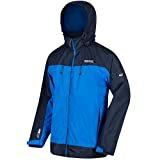 Pertex’s two-way stretch shield fabric, along with the jacket’s articulated sleeves, allow the user to scramble around and climb up and over rocks and boulders with ease. The Minimus’ cuffs extend over the backs of the hands for extra drip protection too. Something that the Montane Minimus has over its competitors is that it is built with 360-degree reflectivity, making it the perfect companion for biking, running or hiking after the sun has gone down (or before it comes up if you’re really keen). The articulated arms are designed to allow for high-reaching movement without too much hem lift and the general all round fit and comfort is not as stiff as heavier shells. The adjustable hood is controlled with three-point adjustment with a wired peak to keep rain running away from the face and it is also helmet compatible. Other features that work well on this jacket are the Velcro cuffs to provide a secure and dry internal area, easy to use toggles around the hood and additional reflective zones on the elbows and chest. The Minimus can be rolled up pretty tightly and stowed in a separate stuff sack, and with a pack size of a large apple it will hardly be noticed when not in use. The Minimalist jacket comes from the reputable outdoor-wear makers – Marmot. It has many similarities to a hard shell jacket but falls in the price range of a rain shell jacket. Functional and basic without giving up any of its quality elements or aesthetic. The Gore-Tex construction means it scores well in the waterproof and breathability departments. The jacket is made from Gore-Tex Paclite, which is the lightest fabric in the membrane range and means that it can be packed up smaller than some of its counterparts. As a result, the Minimalist Jacket is suited to those who are restricted to a small bag or looking to travel light. The all-weather protection is completed by the well-designed hood, which offers a stiffened brim that can be adjusted via two elastic cinch cords, one to adjust the hood on the face and one to adjust the brow. Taped seams ensure true weatherproofing by sealing up all points where wind and water could leak in. Toggles allow the user to adjust the fit, and the pit zips mean additional ventilation in warmer Spring/Summer months. This ultra lightweight jacket is aptly named. Weighing in at under 200 grams, the Helium shell offers a barely there feel for users that want to carry an emergency jacket without ever being weighed down by it. It is genuinely so light and packs down so small that you’d quickly forget it was clipped to your harness until you threw it on in a sudden mid-trail downpour. 100% waterproof, windproof and breathable, the Helium is suitable for most uses and could be worn over layers in colder temperatures or warmer ones with a simple T-shirt underneath. Although the material feels thin, it certainly isn’t weak. Thanks to its laminated construction with seam-taping and YKK AquaGuard zippers, its pretty durable for its weight and can be relied on when the heavens open. The elastic cord on the back of the hood allows it to be tightened, securing it close in to the wearer’s head to avoid blowing down in the wind. Even without ventilation zippers the jacket is relatively breathable, allowing moisture to flow out. The trade offs in terms of being so lightweight are the lack of hand pockets, zipper vents and lining. However, the Helium does offer internal pockets, which are perfect for your phone, map or keys. We would have liked them to be zippable for extra peace of mind, but the Helium’s less-is-more approach doesn’t allow for these sorts of extras. Other useful features we liked were the reflective logos, adjustable waistband, a carabiner loop, and the internal pocket that doubles as a stuff sack. The Zeta AR jacket is a part of the Arc’teryx Traverse range and is a heavier weight version of its well-loved predecessors. The Zeta AR Jacket falls somewhere in between being light and medium in weight, made from N70p three-layer Gore-tex fabric. So whilst it’s thick enough, it’s not Arc’teryx’s most heavy duty shell, so it would not be too wise to subject it to scrapes and scrubs. Nonetheless, it’s very high quality and plenty durable for standard wear and tear. The Zeta is suited for year round use thanks to its outstanding waterproofing combined with a lightweight construction and breathability. Because it’s not too heavy, it also provides a good level of comfort and protection, feeling soft next to the skin but also being versatile enough to wear over multiple layers. The jacket is a great option for hikers and trekkers that need to be able to wear it throughout Spring and Autumn but who might also be braving harsher conditions. The pit zips allow for ventilation, so the wearer doesn’t have to endure that sweaty clammy feeling during exertion. The Gore C-Knit backer material feels good against your skin, the scooped tail provides extra protection for cyclists, the internal pocket has the added bonus of a zip, and the hood adjustments work well – allowing the hood to move with you as you turn without impairing your vision. The fact that the zips on the pockets move downwards (to help stop rain flowing into the pockets) is a bit of a faff in gloves, but wasn’t a deal breaker. Despite it being pretty (actually very) pricey, we found it to be one of the most effective and comfortable jackets on the market and in this case you certainly get what you pay for. And the fact that you can pack it into its own hood to stow it away in your bag is the cherry on top. The Impellor jacket is the lightest waterproof shell by Mountain Equipment sitting perfectly at the intersection of super light and super waterproof. This minimalist shell offers the exceptional breathability of the lightest Gore-Tex Active fabric with the reliability and trusted design from a renowned outdoor clothing manufacturer. To ditch some weight, the Impellor leaves out the hand pockets (although you do get an ok-sized chest pocket), uses elastic on the hem and cuffs instead of cinch cords and has just one toggle for adjusting the back of the hood. The sleeve ends are partly elasticated, to keep a tight fit around the wrists and stop water flowing in in major rain showers. The short hem length left some taller testers’ base layers exposed but this would be true of numerous options on the market. The pluses of being so lightweight (aside from the fact it’s a mere 170g – you’d hardly notice it in your bag) is its ability to condense down into a small pack, its softness and suppleness, and its outstanding breathability. Gore-Tex’s three-layer Active Shell keeps wearers totally dry using a thinner membrane and ditches the old tricot liner for Gore’s C-Knit backer, a softer, lighter option. The Impellor’s trim cut heightens breathability (possibly because there’s simply less distance for vapour to travel), so even when on the move in muggy rain, sweat can escape the body. On the downside, the most lightweight jackets are those that are most prone to scuffs and tears due to their thinner nature. The Impellor’s 15-denier fabric is less durable than some of the hard shell jackets reviewed above but it’s still impressively resilient. A classic conundrum for active individuals that are on the move outdoors is trying to find products (both clothing and other kit) that offer the sweet spot between features/ added functionality and weight. Hardwear’s Quasar light jacket seems to get the balance just about right. Although it’s not the lightest jacket on our list, it offers the best of the features you might expect from a tough-enough jacket. An adjustable, helmet-compatible hood with a stiff brim makes sure that the material fits close enough to the head and face whilst also directing rain away from the body, even when turning. The four pockets (two hand pockets above a hip belt and two internal mesh pouches) offer ample storage for maps, gloves, water and snacks and are easily accessible. Short-but-effective pit zips release vapour to stop swear or heat build up, assisting the 2.5-layer nylon Dry.Q Elite fabric which is durable but its air-permeable membrane is designed to prevent overheating. But it holds its own equally well in cooler temperatures. During testing, heavy snow just bounced right off the jacket, as did water droplets – running straight off the water repellant material. Despite the ‘lite’ part of its name and image, the 30-denier nylon face fabric is far tougher than some of its counterparts, and the jacket is popular with hikers that have to scramble over rocks or push through branches and bush. Mountain Hardwear have recently released their Men’s Quasar Lite Jacket II – so if you like this and you can afford to up your expenditure slightly, then it could also be worth a look!